Size: 10 1/2" x 13 3/4"
This Vintage January 12, 1959 Life Magazine is complete and in good condition. This magazine measures approx. 10 1/2 x 13 3/4 and is suitable for framing. 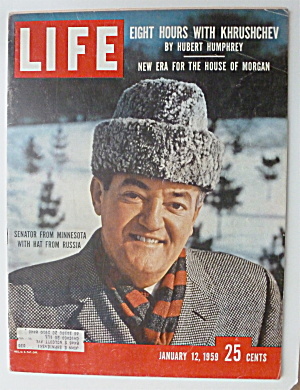 The front cover features Senator From Minnesota With Hat From Russia. The other headlines on the front cover are Eight Hours With Krushchev By Hubert Humphrey & New Era For The House Of Morgan.